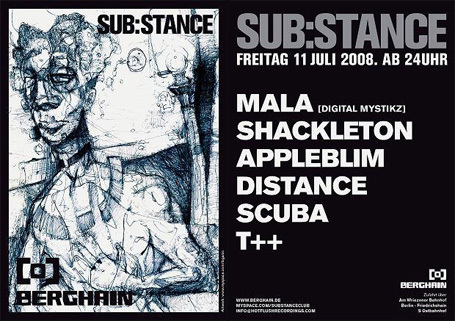 A few weeks ago, a simple, black-and-white flyer surfaced in Berlin, with a pencil drawing printed on the front and the names of Mala, Shackleton, Appleblim, Distance and Scuba on its back. Anyone interested in dubstep will certainly agree that the line-up alone would be a reason to get excited. But what makes the party really extraordinary is its venue – Berlin’s much fabled techno super club Berghain. „Substance“ is the brainchild of Paul Rose, owner of Hotflush Recordings and dj/producer in the guise of Scuba, who moved to Berlin last year and since then has established close ties to some of the main players in the city’s techno scene. With influential UK artists like Scuba and Shackleton setting up their residence in Berlin and dubstep entering Berghain, one could be easily tempted to argue that dubstep is now fully established in the German capital. But huge events like Substance still don’t make a (long-lasting) scene. It’s what happens at the ground level that matters in this respect – local promoters, home-grown labels and producers working on their own definition of the genre. That’s why „More Bass!“ is embarking on a journey in search of all the little dubstep cells that have grown all over the country recently. Let’s start in Berlin, where the German/English/Israeli group Jazzsteppa have set up their base camp. Jazzsteppa are a proper band, whose three members use traditional instruments like trombone and drums as well as various electronic means of sound creation. Some of their music is reminiscent of UK dub bands like Zion Train that use a similar formation. Jazzsteppa’s most recent release though, a 12“ called „Five“ on MG 77, proves that they have found their own disctinctive sound. The highlight of the record is a track called „America B“ that cites the „Imperial March“ from John William’s „Star Wars“ score. Included on the record is a remix of the title track by Phokus. The producer from Hamburg has already provided beats for Ruff Sqwad’s Tinchy Stryder and his take on dubstep is accordingly very much influenced by grime and hip-hop. Phokus also appears on the second 7“ release of the brilliantly named Police in Helicopter label. It’s a collaboration with fellow Hamburger The Next and called „Inta“. The remix on the flip side takes us to Cologne, where Wadadda has added some extra bass pressure to the original track in his „Tabanackle Dub Chamber“ studio. Cologne also is the residence of Desmond Denker, who is responsible for the wonderful „Boxed Freedom“ EP on Basspräsidium Records. Denker (German for: „thinker“) obviously loves his bleepy 8-bit melodies, which he skillfully combines with complex rhythm tracks. Offenbach (in the Main/Rhein-region, close to Frankfurt) and Wismar (on the Baltic coast) are the last stops of this little tour and the home bases of the four-headed Dutty Dubz collective. Dutty Dubz have stepped into the limelight last year when Skream started playing tunes from group member Twisted (aka Goldfinger), notably a euphoric remix of Ray Keith’s Jungle classic „Terrorist“. Their latest vinyl offering is a 12“ on Dub Bullet split up between RAkoon and Twisted. Rakoon’s contribution „The Ghost & The Darkness“ truly lives up to its name with menacing halfstep sounds, whereas Twisted’s „Prophecy“ is dominated by a slightly aggressive wobble bass. Twisted’s arguably best tune so far, „Contact“ – a funky and electro-influenced halfstep tune – has just been released on 2nd Drop Records.